Tag team action seems to be the common theme in this arc. And while that’s all fine and dandy it’s hard to acknowledge a grand slam by Yo Tan Wa. The issue, which is debatable, the manner in which king Rozo is defeated, however, I blame him for his own death. No matter how difficult it is to accept we need to understand that he alone sanctioned the end result. Also, it’s my sentiment that Shun Sui Ju basically abandoned the Quanrong. I wonder, if Ri Boku had been in the same situation would he have done the same. I don’t think so. What I don’t understand is that by avoiding one problem he creates another. Meaning, the principal objective behind his every attempt was to secure Yo Tan Wa’s death. It’s also why he lured them away from Ri Boku and into Quanrong territory. To deliver them to the Quanrong, to shield Ri Boku from getting blindsided by another army, and to gain an advantage (as common sense dictates) the indigenous population is generally more familiar with their neck of the woods, especially the terrain versus outsiders. Well, what’s stopping Yo Tan Wa from doing so now? Nothing really. His poor judgement in this particular situation is a contradiction to the character he’s established thus far. This is not his typical modus operandi. You telling me, that he, or anyone with superior intellect can’t see how this drastically affects everything he’s worked for. I don't buy it. What happened to maintaining the upper hand? 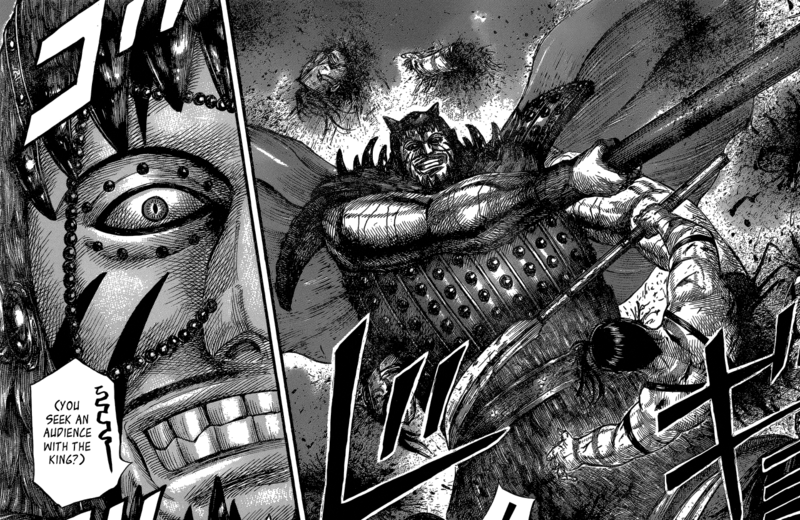 Ch.571 Pg.06 A tribute to one of the strongest, King Rozo (aka Skull Crusher). Shin would have loved to go toe-to-toe with this monster. We salute you King Rozo!